Atiku Abubakar, presidential candidate of the Peoples Democratic Party (PDP), says he once was a firewood seller in Jada, Adamawa state. The former vice-president made this known on Monday while launching his presidential campaign via a broadcast on Facebook. “I started out as an orphan selling firewood on the streets of Jada in Adamawa, but God, through the Nigerian state, invested in me and here I am today. If Nigeria worked for me, I owe it as my duty to make sure that Nigeria also works for you,” he said. During the broadcast, Atiku said his primary focus is getting Nigeria to work again. “The most important question in this election is: Are you better off than you were four years ago? Are we richer or poorer?” he asked. “I am not making grandiose promises. Rather than promises, I believe in policies. “A promise is an indication to do a future action. A policy is a plan to achieve future goal. As the International Monetary Fund stated very recently, it is the failure of this government to have a coherent and comprehensive set of policies combined with poor leadership that has led to its failure to deliver. 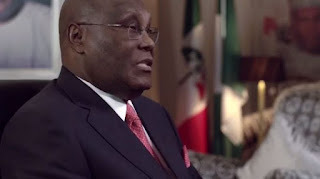 Atiku said while he was vice-president between 1999 and 2007, he chaired the national economic council that “gave Nigeria her highest and most consistent GDP growth of over 6% per annum”. If elected, Atiku said he will be proactive in attracting investment and supporting the small and medium scale enterprises across Nigeria for the purpose of doubling the gross domestic product (GDP) by 2025. In the policy document seen on Sunday by TheCable, Atiku shared his plan to embark on partial privatisation of the Nigerian National Petroleum Corporation (NNPC) and to also cut corporate income tax.